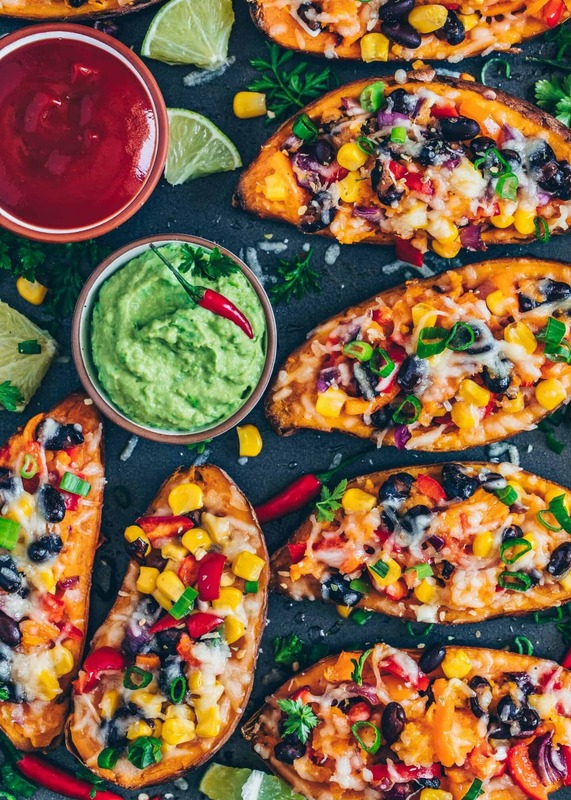 These loaded Mexican Sweet Potato Skins are filled with black beans, corn, pepper and topped with vegan cheese. 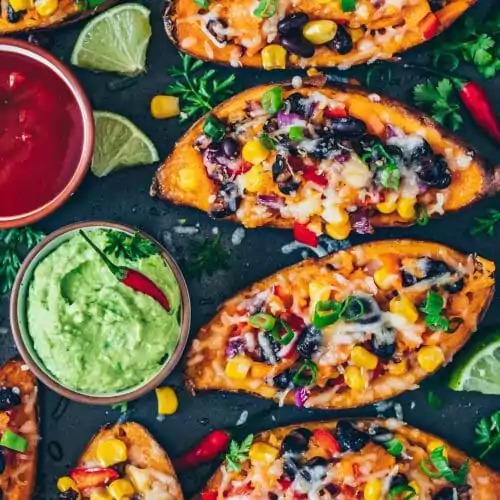 Serve these stuffed Sweet Potatoes with homemade avocado aioli for a tasty, easy and healthy dinner! This post contains step-by-step pictures. Do you guys like Mexican food? If you were to ask me, the answer would definitely be YES! 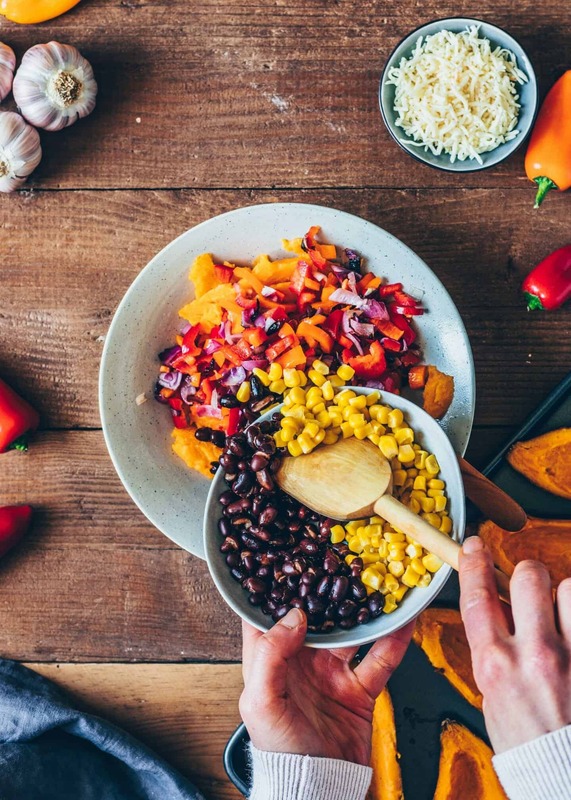 I mean, could there be anything better than having a delicious Mexican-inspired meal that is loaded with healthy vegetables, protein-rich beans, and sweet corn? 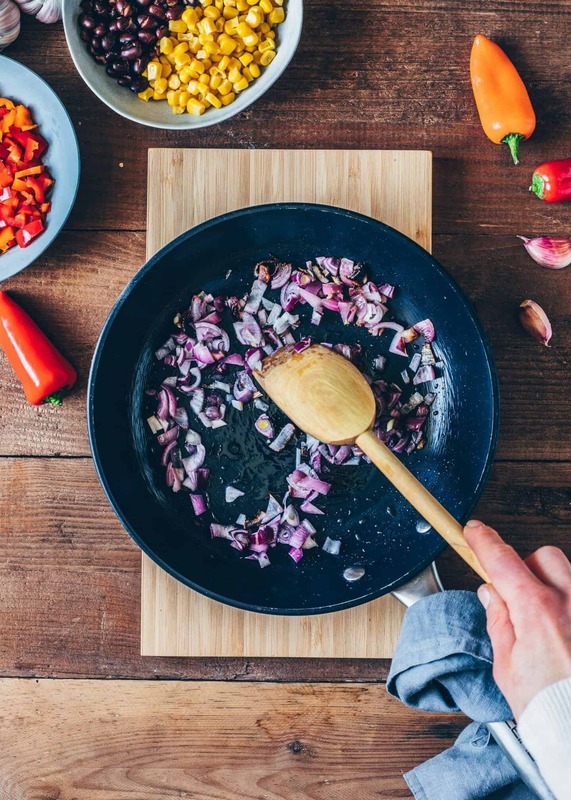 Especially when it’s combined with flavorful roasted onions, garlic, and some spices. The taste of this mixture is absolutely to die for! 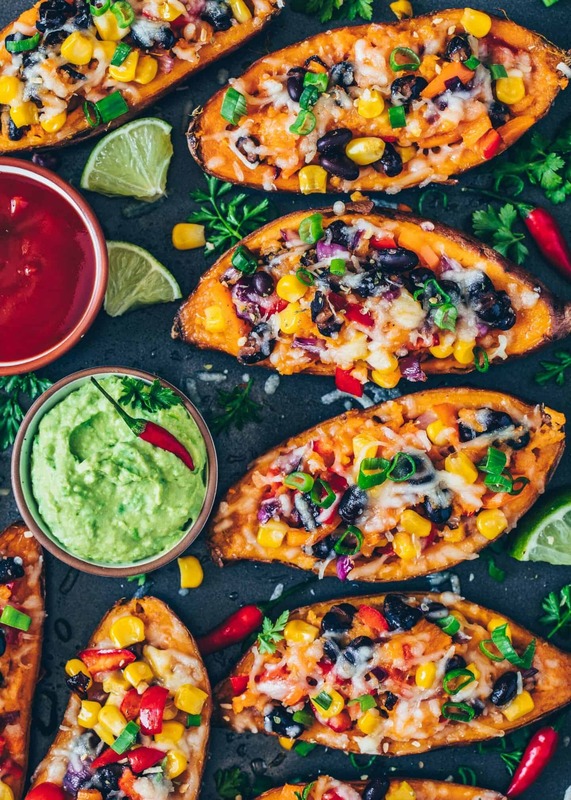 And when you sprinkle non-dairy cheese on top, bake it until it’s melted and then serve it with avocado Aioli, it‘s so good, you’ll want to eat stuffed sweet potatoes every day for sure! What I absolutely love about Mexican food is that most of the dishes are very easy to make! 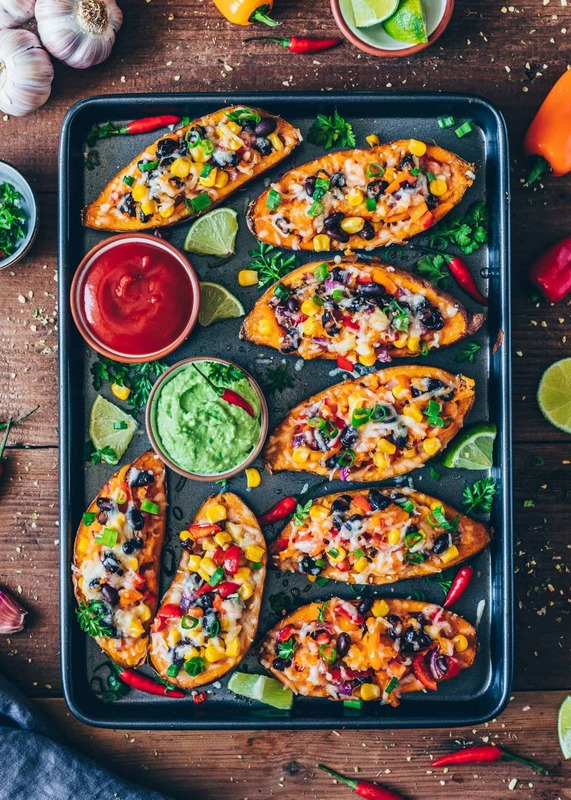 Also, these Mexican sweet potato skins are super simple and the filling is mixed together in no time at all! 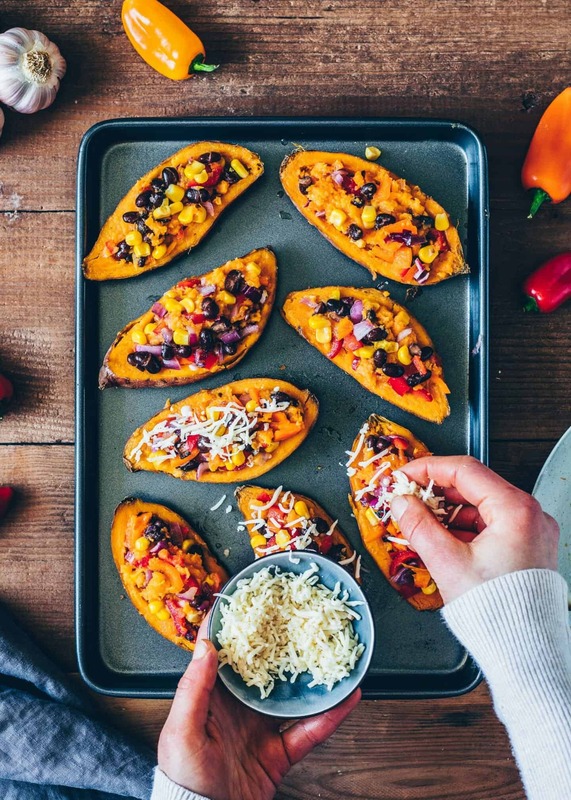 Firstly, bake the sweet potatoes until they’re soft. You can either bake them in the oven or for a quicker version, you can use a microwave. Just make sure to pierce them several times with a fork before baking, so they cook through better. 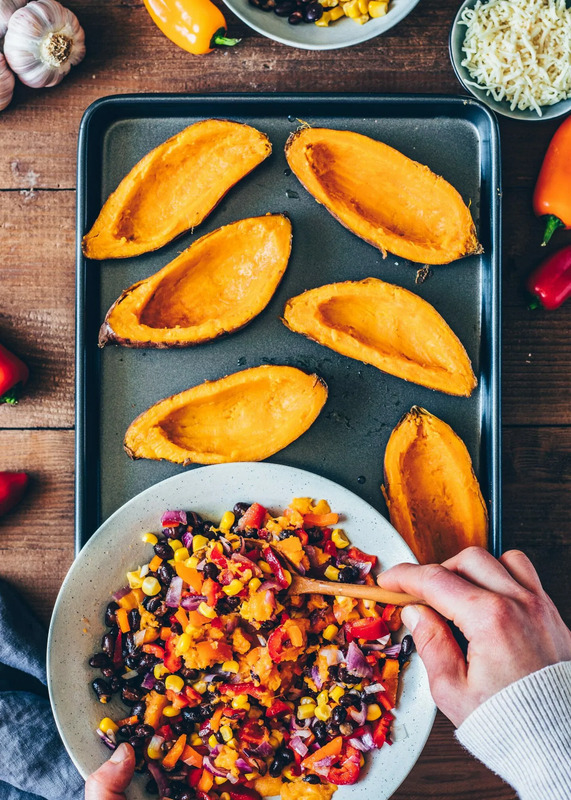 While your sweet potatoes are baking, you can prepare the filling. Heat a bit of oil in a pan. Add the onions and bell pepper and sauté until roasted and softened, about 3-5 minutes. Add the garlic and roast for a further minute until fragrant. Sprinkle with salt, pepper or other seasonings to taste. Set aside. 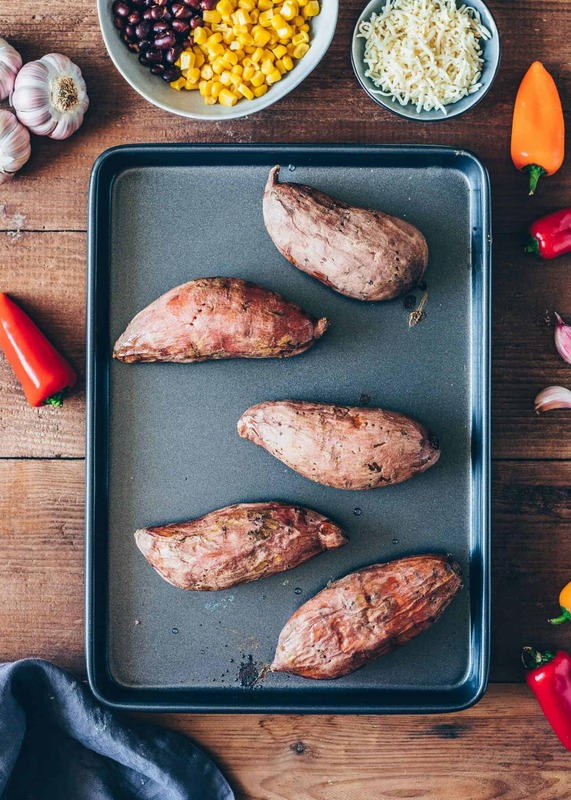 Secondly, when your sweet potatoes are fork-tender remove them from the oven. Once they’re cool enough to handle, cut them in a half. Using a spoon, scoop out the flesh, leaving a thin layer of potato inside of the skins. Thirdly, mash the soft flesh and mix with roasted onions, pepper, and garlic. Also, add beans and corn and mix to combine. 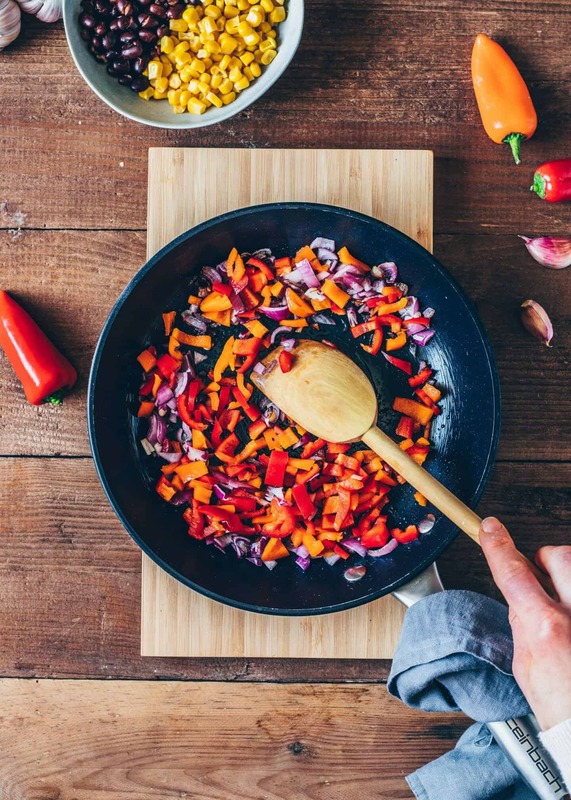 Of course, you can add any veggies you like so feel free to mix and match the ingredients to your liking. 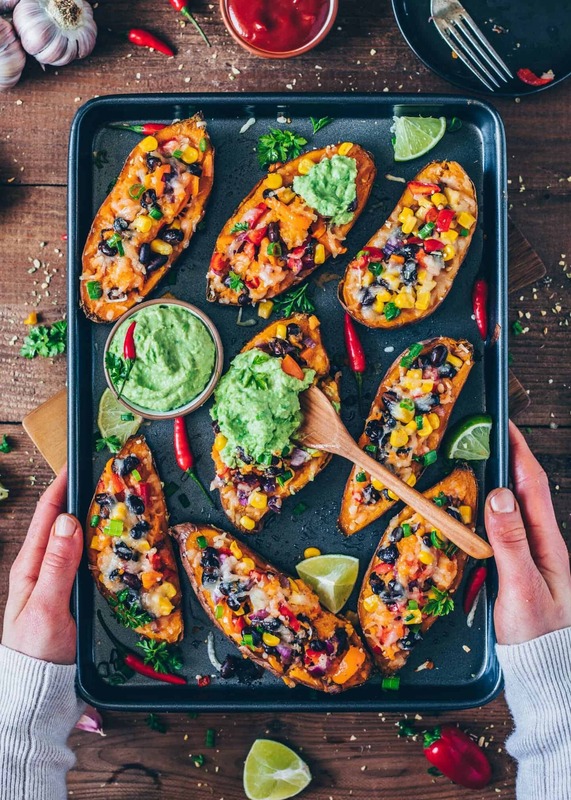 I love to top these Mexican Sweet Potato Skins with Homemade Avocado Aioli which is not only easy to make and totally delicious but, it’s also much healthier than traditional Aioli! Also, there are fewer ingredients required. All you need is an avocado, some garlic, salt, pepper and a squeeze of lemon juice. I also like to stir in a bit of vegan mayonnaise to make it creamier. However, coconut cream, non-dairy cream cheese, or yogurt are also good choices. 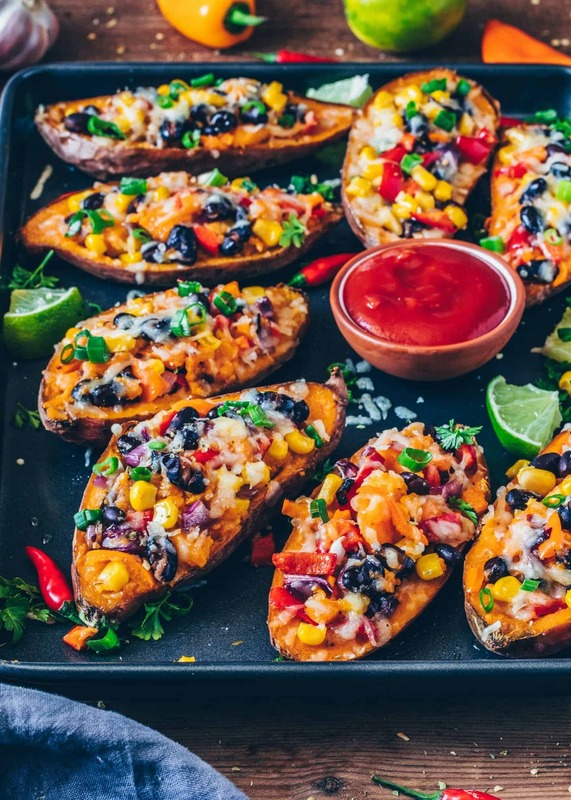 Simply mash everything together and serve as a dip on top of your stuffed sweet potatoes! 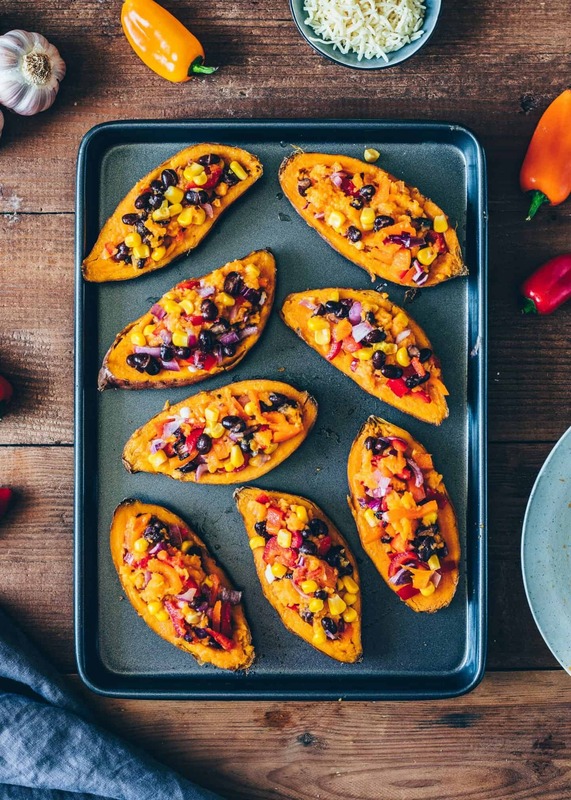 Want more Sweet Potato or Mexican Recipes? 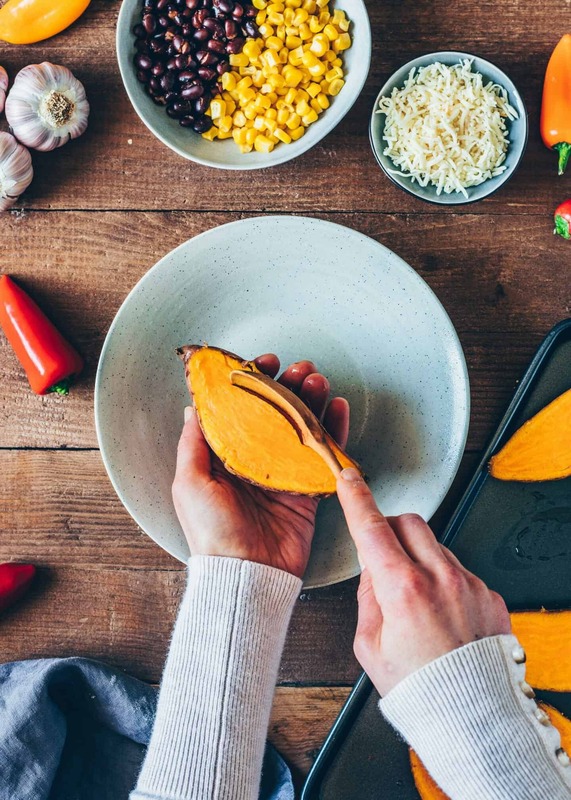 If you’re looking for more similar recipes, you can also try my sweet potato quesadillas, crispy sweet potato fries or sweet potato falafel. 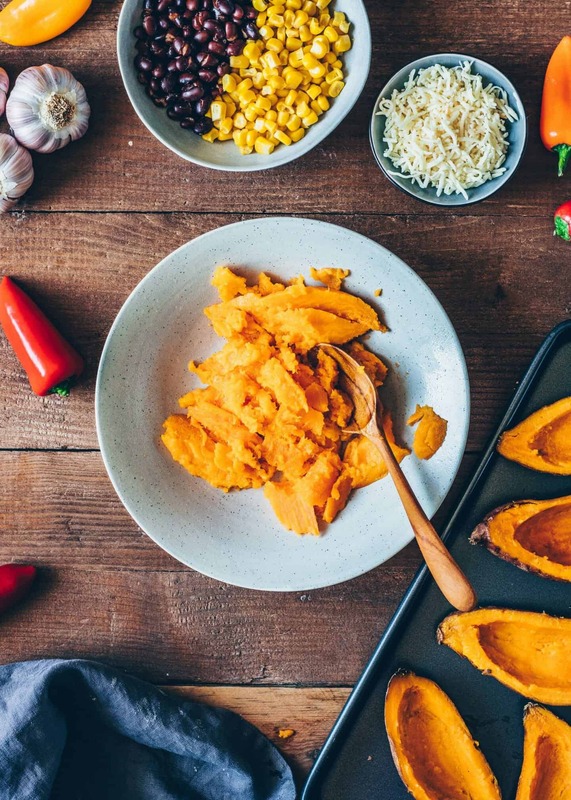 And just in case you want the ultimate comfort food, make sure to check out my delicious tortilla casserole, sweet potato, chickpea, and coconut curry or my beloved sweet potato gnocchi. 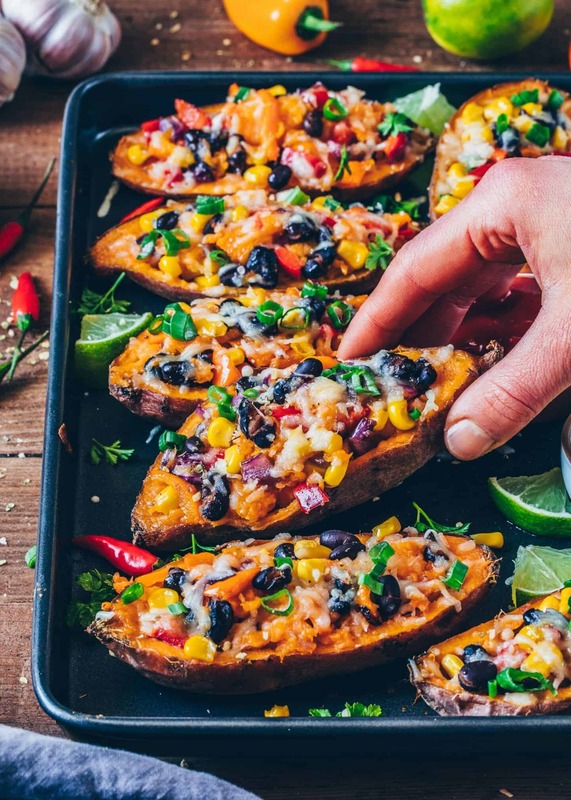 These loaded Mexican Sweet Potato Skins are stuffed with black beans, corn, pepper and topped with vegan cheese. 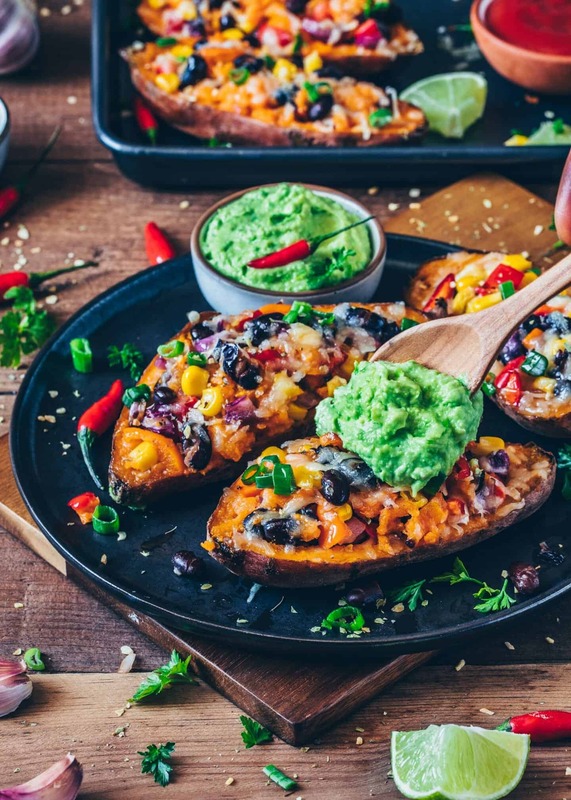 Serve with homemade avocado aioli for a tasty, easy and healthy dinner! Preheat oven to to 430°F (220°C) and lightly grease a baking sheet. 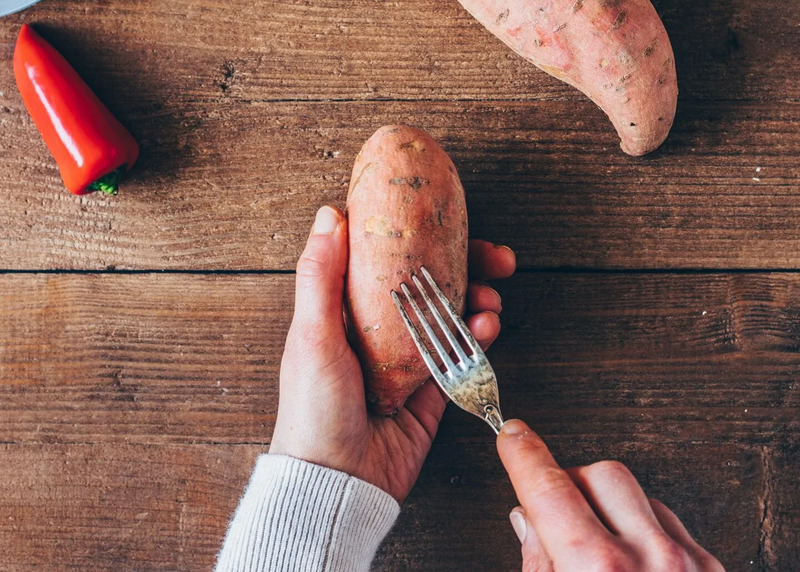 Pierce sweet potatoes a few times with a fork. Arrange them on the tray and roast for about 40-50 minutes, or until tender. 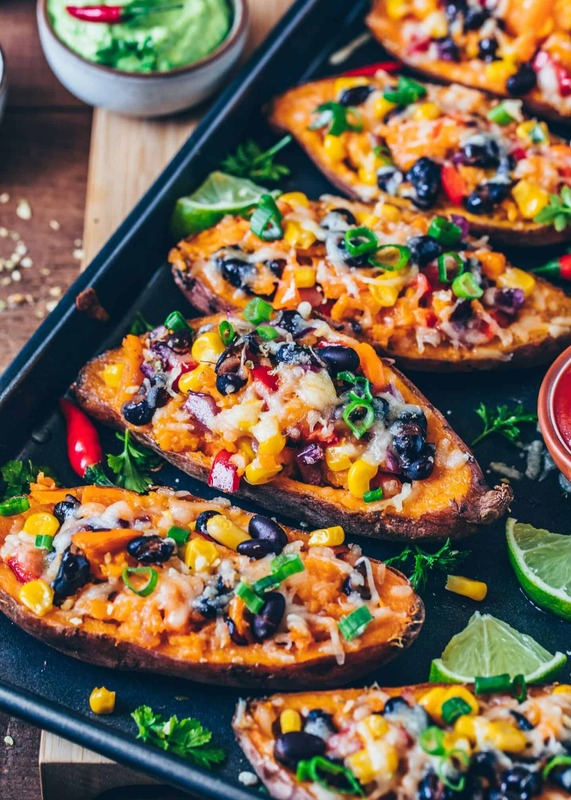 (Smaller sized sweet potatoes are cooked through faster, so pierce with a fork after 40 minutes to check, and continue roasting, if needed until soft). 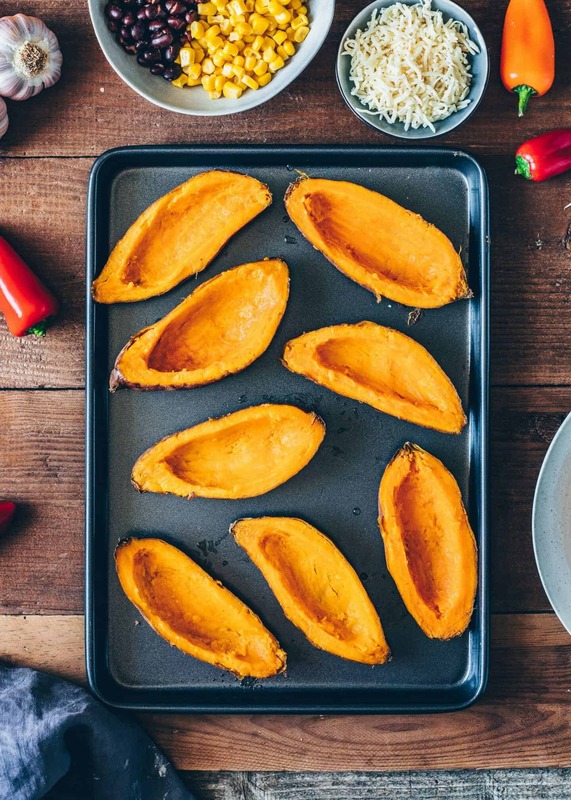 Quick version: Optionally, you can wrap the pierced sweet potato in a kitchen towel and microwave for 10 minutes until soft. 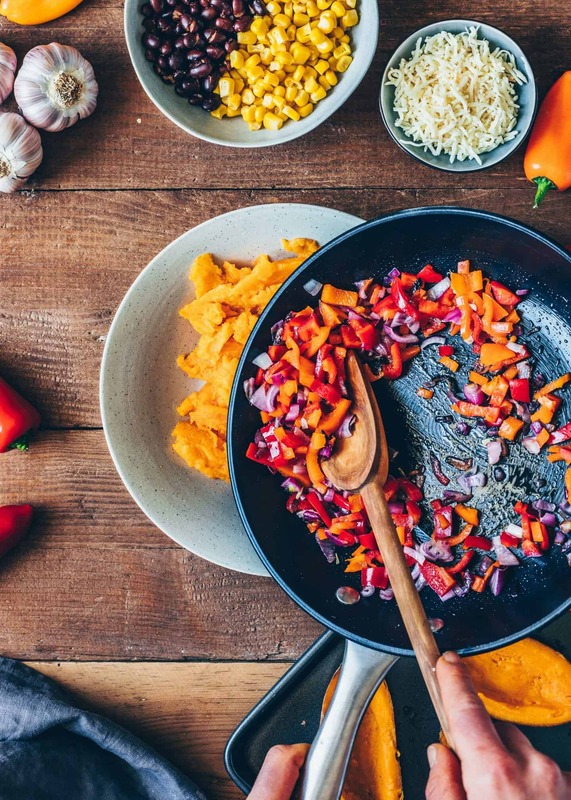 While sweet potatoes are baking, heat the oil in a pan. Add the onions and bell pepper and sauté until roasted and softened, about 3-5 minutes. Add the garlic and roast for a further minute until fragrant. Sprinkle with salt, pepper or other seasonings to taste. Set aside. 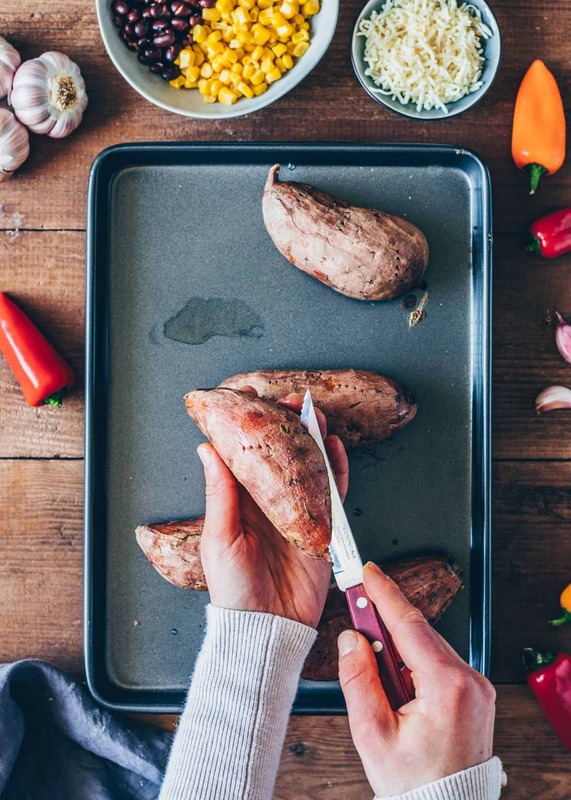 When sweet potatoes are fork-tender remove from the oven. Let cool for 5 minutes, or until cool enough to handle. Cut them in half and scoop out the flesh with a spoon, leaving a thin layer of potato inside of the skins. Mash the soft flesh, add roasted onion mixture, beans, corn, salsa and mix to combine. Bake for about 5-10 minutes or until cheese is melted. Cut the avocado in a half, remove the core. Scoop out the flesh and mash. Add the remaining ingredients for the aioli, mix to combine. 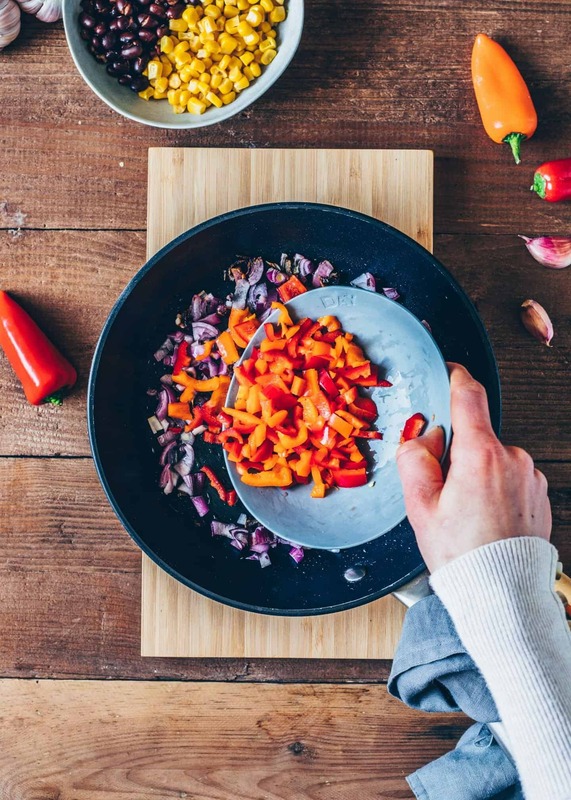 Taste and adjust seasonings to your wish. 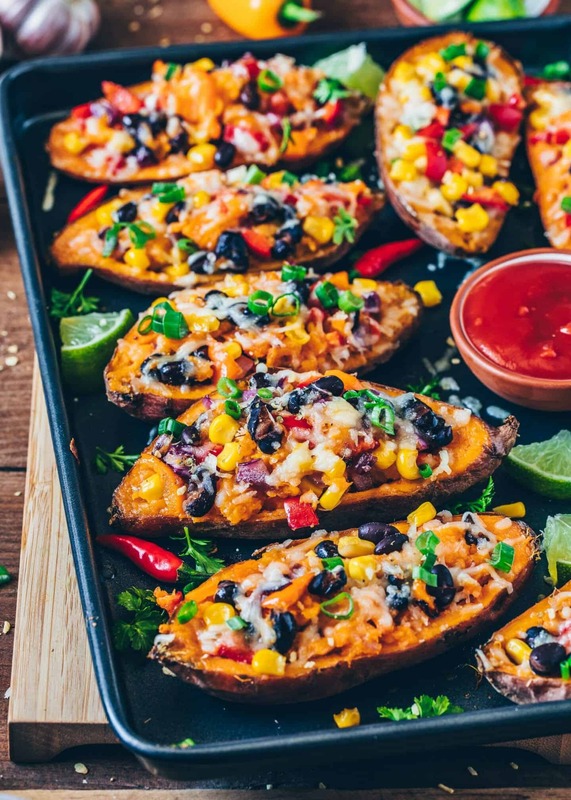 Serve baked sweet potato skins with aioli or other dips of choice. Sprinkle over fresh scallions, parsley or cilantro and a squeeze of lime juice. Instead of vegan mayonnaise, you can also use coconut cream, non-dairy cream cheese, or non-dairy yogurt to make it creamier. Or make Homemade Mayonnaise with this recipe: Cashew Mayonnaise. If you can’t find non-dairy cheese in a store, you can make my easy vegan cheese sauce and drizzle it over top. You can add any type of vegetables of your choice too. Never thought that this dish is made with sweet potato. The only dish that I knew is Boiled Sweet Potato haha. The photos looks very delicious and mouth watering. Will make sure to try this recipe, and yes I agree that this dish is very easy to make. Thank you for sharing. 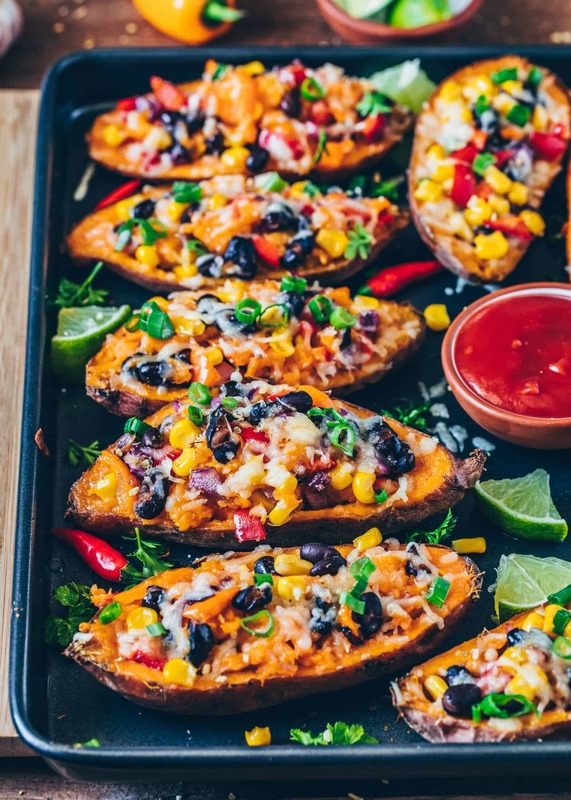 Bianca your mexican sweet potato skins look amazing! Love that they are vegan. Have to try this delicious recipe. Btw. your photos look mouthwatering! Have a wonderful day. I just prepped this for tomorrow’s Lunch/dinner. It is super easy to make and I love the fact that I had most ingredients already. Another plus is that it can be completely vegan or vegetarian. Really yummy, will definitely make it again. These are literally so yummy and healthy! 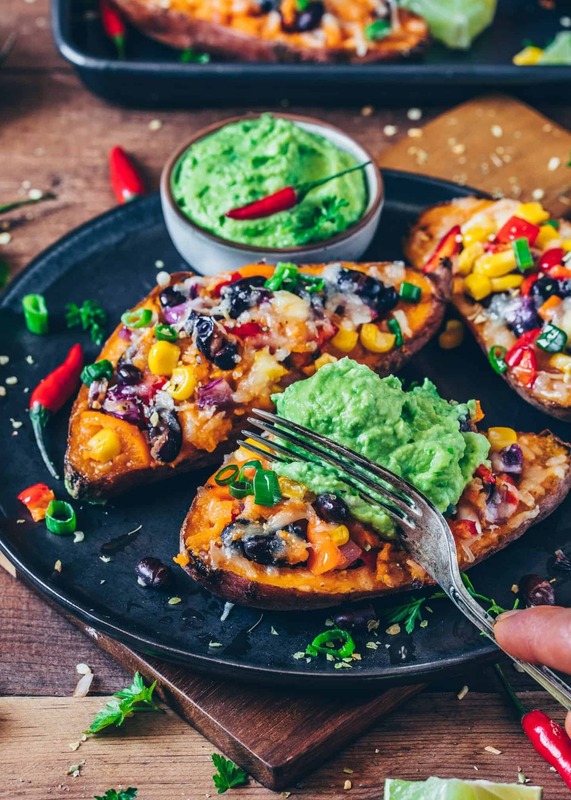 They completely satisfy that carb craving, while getting in a whole lotta nutrition at the same time! So good after swim practice. So happy about that 🙂 Thank you!